This auction is for an original 1880s Splendid Victorian 2 piece dress gown, most likely worn for a reception in the cold winter months. Rare to find, so evident of being a winter gown. 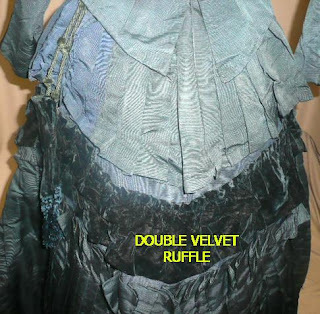 Designed and created by Mll SLATTERY BOSTON - MASS ROBES & CONFECTIONS (label on the waistcinch) on a heavier weight ribbed satin silk faille fabric that is a lovely dark shade of steel blue with a few areas of slightly lighter steel blue inserts and dark but not navy blue luxurious Velvet. Quite elaborate with all the bells and whistles you would want in a bustle gown - pleats, swags, bows, tucks, fringed gathered rosettes, and the rare to find, draping cord passementerie. 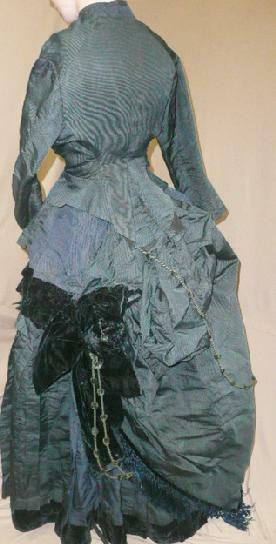 I have included w/ the close-up photos most all the detailing. 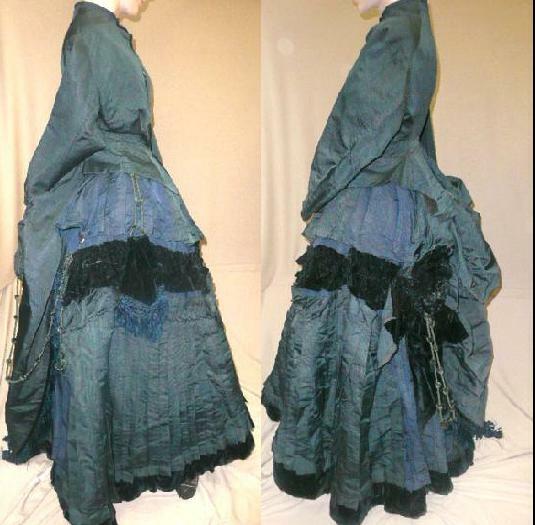 There is wonderful very wide long fringing and a long back full bustled overskirt panel. Each side of the skirt is differently adorned and both so very elaborate. The hemline being wonderfully pleated with a 4" wide ruffled velvet border is perfect completion to this lavishly adorned skirt. 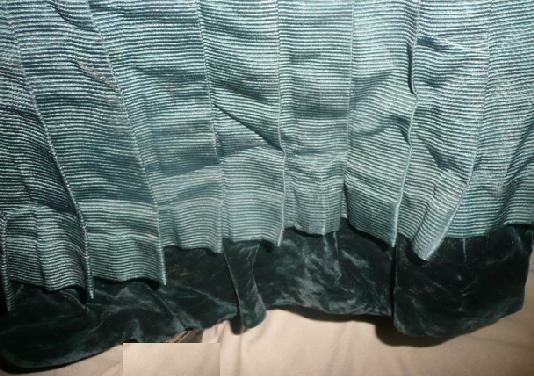 The inner petticoat is perfectly sewn to help keep the bustling stiff and protruding. 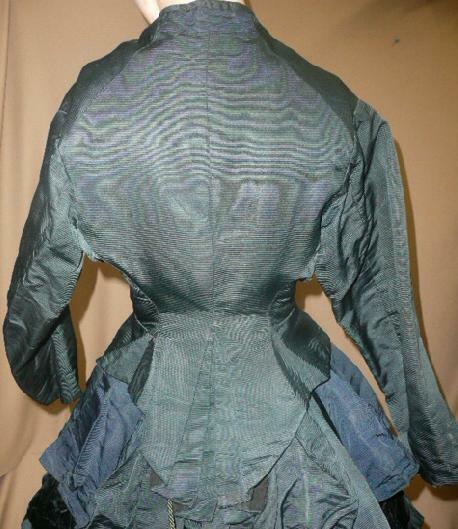 Inside the simple yet elegant Unboned black silk lined bodice you can feel lightly padding thruout which must have been to help keep the wearer warm. 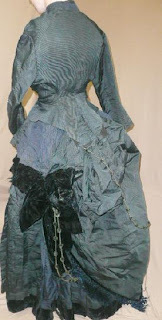 This bodice is naturally a front closure with hidden hooks and eyes, there are small holes near a few of the hooks/eyes. There is Not any underarm marks, it is very clean and fabric is very sound. I personally would decorate the neckline with a simple but highly detailed lace collar or even just add an impressive brooch. In overall very good condition, only back half of the buckram waistband is starting to deteriorate so some of the pleats will need to reattached to a repaired waistband. Overall quite clean and very sound fabric. 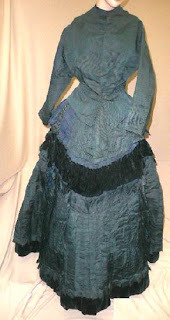 Measures: 34/35" bust, 15.5" shoulder seam to seam,24/25" waist, 18" mid shoulder to waist, 46" long skirt from waist to hem. A heavier weight gown that when commissioning the would be wearer was definitely concerned with not only looking stunning but also stay very warm. 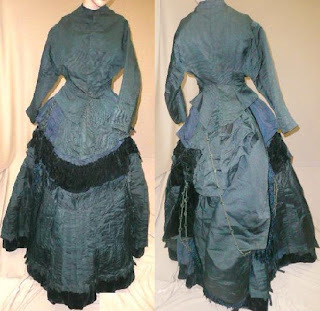 This one of those elaborate so wonderfully detailed gowns that you just want to imagine yourself wearing and getting lost back in the time of the Opulent Victorian era!! The bodice looks wonky on this one to me but I think it's the display.